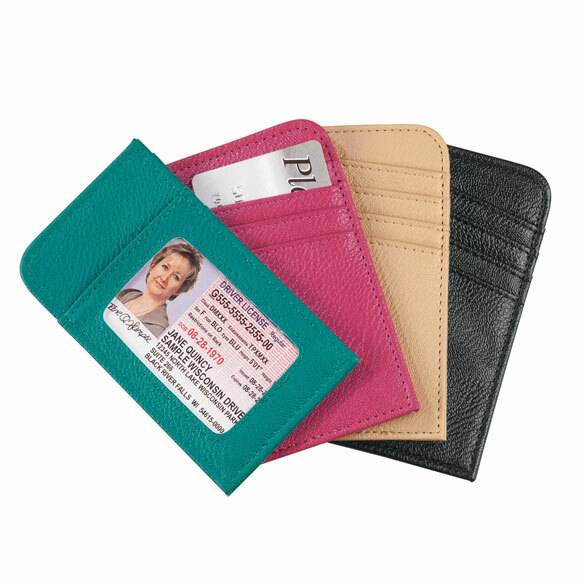 RFID scan safe card sleeve protects your most important data. Slim design organizes four credit cards on one side, reversing to a clear ID card window on the other. RFID protection protects your financial data from the scanners used by tech-savvy thieves. Storing your driver’s license in the window also prevents retailers from scanning the back. Easily slips into a wallet or handbag for easy access. Specify color: raspberry, teal, taupe or black. RFID sleeves measure 5"L x 3"W. Polyurethane/polyester. I purchased this to put my bus ID in and my bus pass. Love it. Neat little pouch. Really handy. I have one and it is perfect. I wanted backups. It shows ID easily and has RFID protection. I have bought other RFID sleeves that have not held up well. I like that this one holds 4 which is what I normally have on me at one time. Lots of traveling you need to have these things together and as compacted as possible, this looks like it will do the job ! nice smaller size for a wristlet. I don't use a purse and this fits well in my pocket to hold my ID and cards. Like the idea of the window on the other side.